It's already over a week since I got back home from the first Robot Framework conference ever – RoboCon 2018. It was a pleasure to be there, and I really feel privileged that I was accepted there as a speaker. RoboCon 2018 was a single day conference about Robot Framework test automation ecosystem, held in the heart of Helsinki, Finland, on 18th of January 2018. The conference venue was quite if not completely full, so there must have been around 250 participants. The event was in English and had pretty good international participation. Yet, most of the participants came from Finland, where Robot Framework has become de-facto standard for test automation. RoboCon 2018 had only a single track, so that had to be packed to include something for everyone in its diverse audience. In addition, there was plenty of time and a separate space for networking with the other participants and conference sponsors. There was also organized social program before and after the conference, but unfortunately, I was unable to attend those at this time. In my opinion the program was well balanced: The conference started with introductory talks, continued with variety of differnet case studies (Kone, Plone and Texas Instruments), and ended with more technical talks about specific Robot Framework addons (SeleniumLibrary, the most awesome new REST library and pabot). And in the middle of everything, there was my personal favorite: Ed Manlove's talk about building successful open source communities. 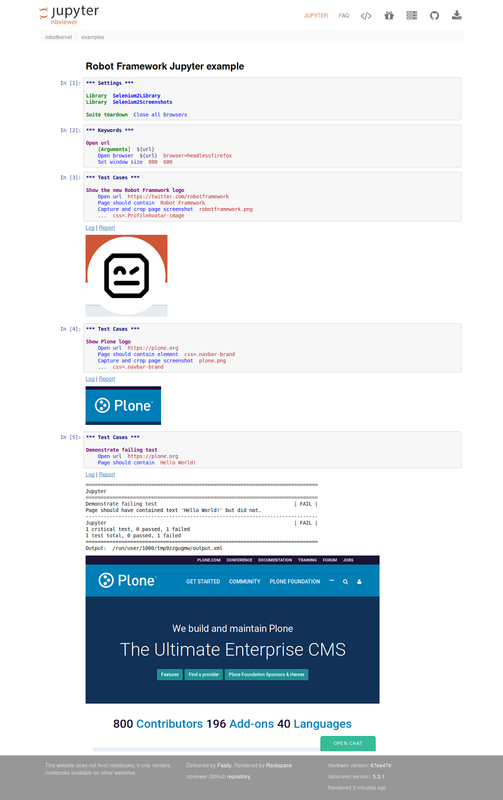 My presentation was called Robot Framework in Plone CMS Project: a case study, story and some technical details, how Robot Framework got successfully adopted in distributed open source community behind Plone. After the conference on Thursday came the single day conference sprint on Friday. And if the conference was a success, the sprint was even more so: the sprint venue, three large office rooms, was packed full of sprinters, many of them participating their first open source sprint (and got a good introduction to open source development from Ed). Because I had to leave early in Friday, I had planned a very specific sprint goal for myself: a MVP Robot Framework kernel for Jupyter notebook. Jupyter notebook (previously known as IPython notebook) is an open-source web application for creating and sharing documents that contain live code, equations, visualizations and narrative text. The architecture behind Jupyter notebook separates the notebook application from its language specific ”kernels” that are responsible for executing the code in notebooks. Syntax highlighting in notebooks, on the other hand, is provided by CodeMirror project for the interactive frontend, and Pygments for server side generated highlighting. I'm happy to say that I made it. And the more I use it, the more confident I get on that Jupyter makes a great platform for learning also Robot Framework. And not only for learning by yourself, but also for sharing your notes with others. Check my example notebooks to judge the kernel by yourself. Please, note that while these examples are static renderings at http://nbviewer.jupyter.org/, they can be opened and interacted live in any running Jupyter notebook with the new kernel and required Python packages. See the repository for more details. Support for defining and executing Robot Framework test suite cumulatively step by step in successive notebook cells. The main limitation is that each cell should start with a test suite section header (settings, variables, keywords or test suites) even when the same header was already defined in some cell before. HTML log and report files are linked below the executed cells containing the tests. Both files are actually bundled with the notebook in a way that sharing the notebook also shares the log and report files. Images generated during test execution are shown below the executed cells generating the images. Similarly to HTML logs and reports also images are bundled with the notebook for sharing. Support for %%python module LibaryName ”cell magic” to allow defining custom Robot Framework keyword libraries in Python in fly. Once thell cell with a Python library class definition is executed, it can be imported in a successive Robot Framework code cell. If the last keyword of the last test case in the executed cell returns JSON string, it is rendered as cell execution output. I added this quite specific feature to make it more fun to learn RESTinstance library with Jupyter (Output keyword of RESTinstance library returns JSON). Obviously, while the current versions is already fully functional on Python 3, there's still a lot of work (QA, packaging and Python 2 support) left to polish the code for release. I'm looking forward to finish it during the spring.